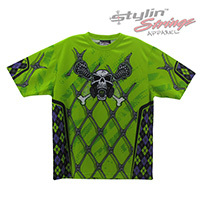 The Toxic sublimated lacrosse shooting shirt displays the full custom skull, gas mask, and lacrosse stick logo. 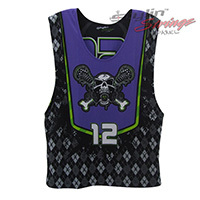 We enlarged the bones pattern from the argyle of the reversibles and made it look thre dimesional with a unique shadow. The tips of the sleeves and down the side pull the same argyle pattern from the black side of the reversible. The bones break back bottom to display the word mark logo.